This is not the first car from 8Fernancraft that improves his skill in designing vehicles. The previous car was a Chevy Camaro that is a muscle of yellow color for quick travel, go to the post to see it. This time we will see a more expensive and rare super car - Lamborghini Sesto Elemento. They are very few in the whole world, only the richest and most famous people can own it. 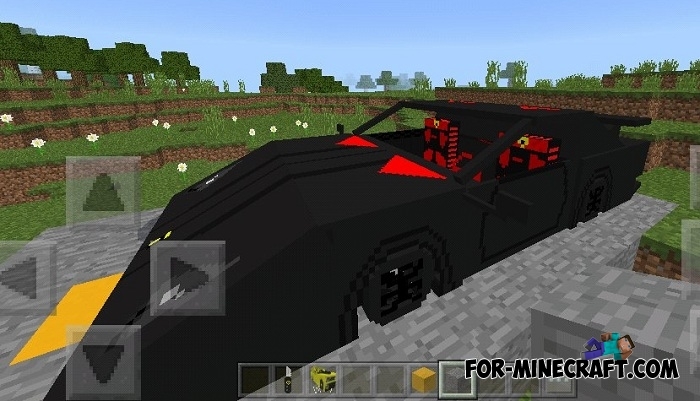 If you do not have such a car and you would like to ride it at least in Minecraft then use this opportunity. Addon adds black lambo with a detailed interior and exterior. Imagine how you open the door and sit behind the wheel then insert the ignition key, move gear shift lever and move forward. It will be better if you build a small network of roads from your home to important points on the map. Thus, it will be much more comfortable for you to move around and not to bounce on the hills. How to install the Lambo addon? Chevy Camaro Addon (Color Update) for Minecraft PEIn the mods category you can find a real car showroom where you have the opportunity to choose any transportation means to your taste..